Behold: The Biggest Horses in the World! These are some HUGE freakin' horses. 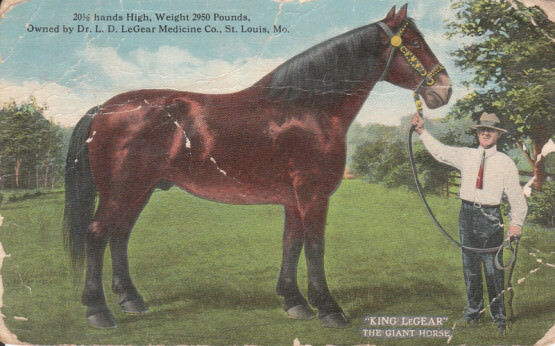 King LeGear, one of the largest horses on record. By all records the tallest of all. While Sampson/Mammoth may have been the biggest there have been some other runners-up over the years worth a mention. By the age of 7, this Clydesdale stood 20.5 hands high and weighed in at 2,950 pounds. He was owned by the founder of a patent veterinary medicine company based in St. Louis, Missouri, Dr. L.D. LeGear, around the turn of the 20th century. This Percheron gelding was also owned by LeGear (perhaps you see a pattern here as far as names) and was truly a king among horses. He stood 21 hands high and weighed 2,995 pounds. 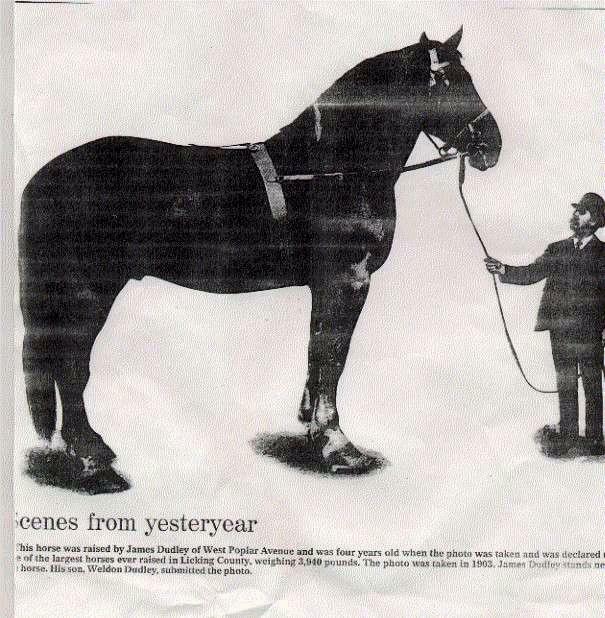 An advertisement in a 1915 periodical, The Southern Planter, billed him as the largest horse in the world and claimed he was worth $25,000 (the equivalent of more than $575,000 today). A Percheron-Arabian draft horse, Morocco was a big hit at both the 1904 St. Louis World’s Fair as well as at Coney Island’s Luna Park, where he was exhibited in 1905. He stood 21.2 hands high, weighed 2,835 pounds, and was described as being “as playful as a kitten” and “a great favorite with the ladies and children everywhere.” He was owned by C.H. Gambol, a breeder from Cleveland. The tallest horse alive today is a 14-year-old Belgian Draft Horse stands just over 20 hands high. That’s 6 feet, 10 inches (as tall as Alonzo Mourning). Big Jake calls Smokey Hollow Farm in Poynette, Wisconsin, home.